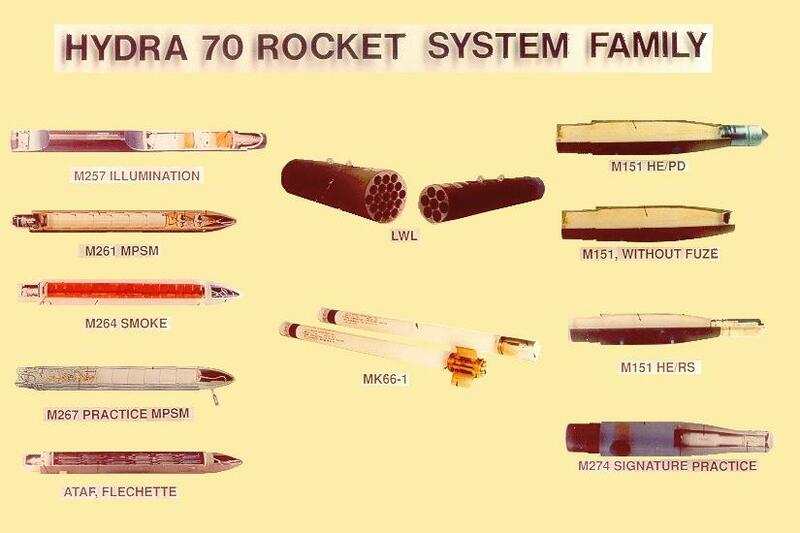 The HYDRA 70 (70mm) Rocket System is a family of 2.75" unguided rockets.The 2.75 inch Folding-Fin Aerial Rocket (FFAR) was originally developed by the US Navy for use as a free-flight aerial rocket in the late 1940s. Used during both the Korean and Vietnam wars, their role has expanded to include air-to-ground, ground-to-air, and ground-to-ground. 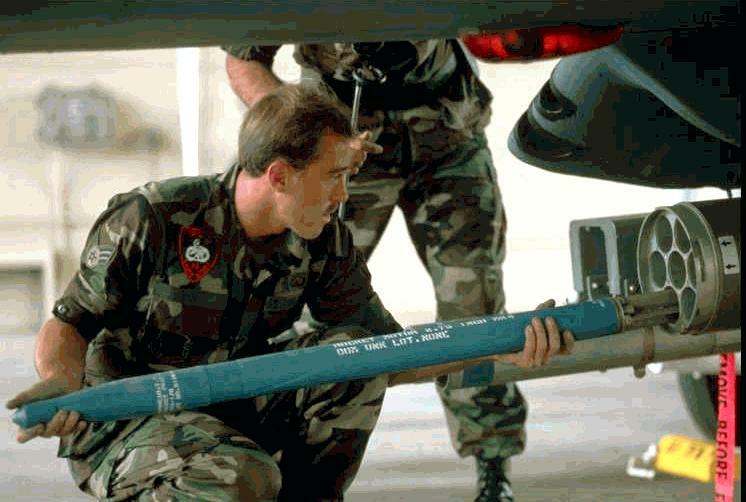 The 2.75 inch rocket system has a rich history of providing close air support to ground forces from about 20 different firing platforms, both fixed-wing and armed helicopters, by all US armed services. When the requirements of this system were changed to a new air-to-ground role for fixed and rotary wing aircraft, new fuzing and warhead performance characteristics, as well as a modified motor for low speed aircraft became necessary. The HYDRA 70 family of rockets was designed to fill this role. The Hydra 70 rocket system is used by US Army Special Operations Forces, the US Marine Corps, the US Navy, and the US Air Force. 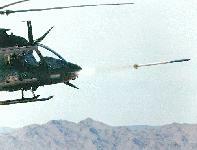 The Hydra-70 rocket is fired from all armed Army Helicopters and the armed helicopters of most sister services. The rocket is also fired from many U.S. fixed wing platforms and is a major export munition to many allied nations. The Army's Hydra-70 PM at Rock Island, IL is assigned as the single item manager responsibile for meeting the rocket needs of all users. Literally millions of these munitions were fired in Vietnam. 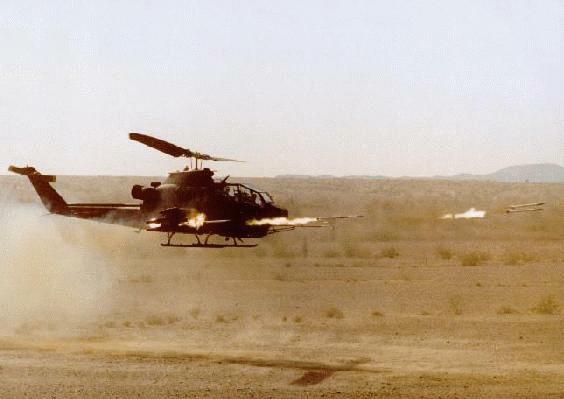 Helicopters armed with HYDRA-70 rockets were also deployed in Operation Just Cause as well as Desert Storm. The APACHE helicopters that opened the air campaign by destroying two radar sites inside Iraq with HELLFIRE missiles also used HYDRA-70 rockets which hit and scattered thousands of razor-sharp flechettes across the sites. The 2.75-inch munitions also proved useful during the ground phase of the Gulf War. Members of the 2d Battalion, 229th Attack Helicopter Regiment from Fort Rucker, Alabama, used primarily 30-mm chain guns and 2.75-inch rockets against the fortified positions and large bunker complexes they encountered during the second day of the ground offensive. The war reserve unitary and cargo warheads are used for anti-materiel, anti-personnel, and suppression missions. The Hydra 70 family of Folding-Fin Aerial Rockets (FFAR) also includes smoke screening, illumination, and training warheads. 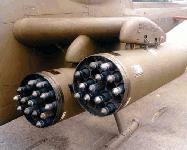 These rockets are used by rotary, wing, fixed and ground platforms. The most widely used application is on helicopters for air-to-ground engagements. 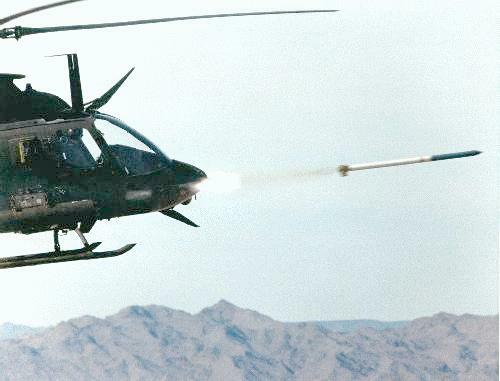 In the US Army, Hydra 70 rockets are fired from the AH-64A Apache/AH-64D Apache Longbow using M261 19-tube rocket launchers, and the OH-58D Kiowa Warrior and the AH-1F "modernized" Cobra using seven-tube M260 rocket launchers. The AH-1G Cobra and the UH-1B "Huey" used M200 19-tube rocket launchers. The Navy uses the 19 round LAU-61C/A and the seven round LAU-68 D/A rocket launchers. These reusable launchers have an external thermal coating that greatly prolongs cook-off protection time. Full production of these launchers began in June 1985. To provide some stability the four rocket nozzles are scarfed at an angle to impart a slight spin to the rocket during flight. The modified motor provides increased stand-off range and reduced ballistic dispersion. The MK 66 rocket motor was designed to provide a common 2.75-inch rocket for helicopters and high-performance aircraft. Compared to the MK 40 motor, it has a longer tube, an improved double base solid propellant, and a different nozzle and fin assembly. Increased velocity and spin provide improved trajectory stability for better accuracy. The launch signature and smoke trail have been significantly reduced. The MK 66 Mod 1 is not hazards of electromagnetic radiation to ordnance safe. It can be inadvertently ignited by electromagnetic radiation, especially by radio frequencies found aboard Navy ships. Both the Mod 2 and Mod 3 have HERO filters, and the Mod 2 filter may prevent the AH-1 rocket management system from inventorying. The Mod 1 is the standard motor for Army use as will be the Mod 3 when it is fielded. The HYDRA-70/2.75 Inch Rocket System is managed by Project Management Office, 2.75-Inch (70mm) Rockets. This office is a new Project Management Office, effective 01 October 1997. The 2.75"/HYDRA Rocket Acquisition Team received the Secretary of the Army Award for Excellence for Systems Contracting at a ceremony on 14 December 1998. Currently, General Dynamics is the general contractor for the rocket system and Thiokol produces flare rockets. 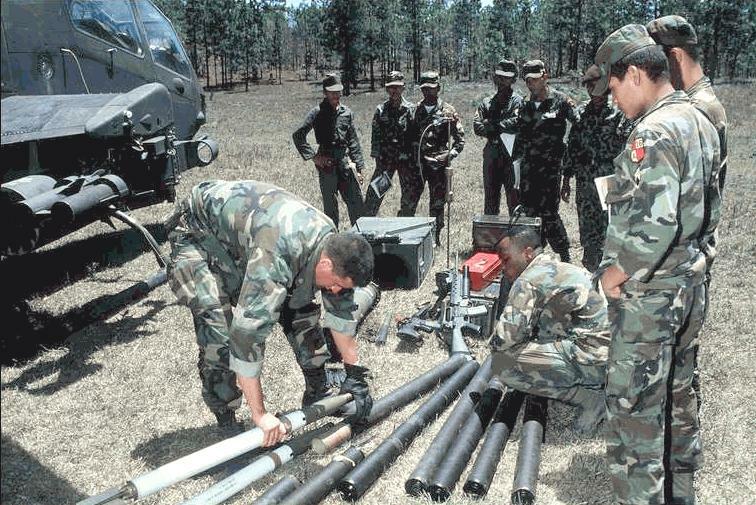 The M260 Light Weight Launcher is a seven-tube launcher. The M261 Light Weight Launcher is a nineteen-tube launcher. The MK66 motors use a longer motor tube (than the older MK40/MK4), that is of a different aluminum alloy, and is assembled with a new fin and nozzle assembly. The fins are of a spring loaded, wrap around design, and are attached around the circumference of the single nozzle. The propellant grain is longer and of a different formulation than that of the MK40/MK4, however, the stabilizing rod and igniter are essentially the same design. The MK66 motors have a substatially higher thrust, 1335 lbs, and a longer range than the older motors. The current generation of the MK66 in use by the U.S. Armed Services are the MK66 MOD 3 for the Army, and the MK66 Mod 2 for the Air Force, Navy, and Special Operations Force. The MOD 3 incorporates a Hazard of Electromagnetic Radiation to Ordnance (HERO)safe electronic RF filter in the igniter circuit. The RF filter is mounted onto the igniter can and allows the aircraft's direct current firing pulse to pass to the igniter squib, but absorbs and dissipates RF energy. The RF filter does not change the electrical resistance of the firing circuit. Electromagnetic Test Report SR-RD-TE-87-43 dated 8 May 1987 documents the HERO suitability of the MK66 MOD 3 motor. A brass EMR shield is used over the fin and nozzle to prevent the DC energy produced by the eletrical arcing encountered when loading motors into launchers in high intensity RF fields from igniting the motor. These shields are furnished with the MOD 3 motor and should be retained for unloading rockets. Due to the shipboard concern of Foreign Object Damage (FOD), the other Armed Services use the MOD 2 motor. The MOD 2 contains a Dahlgren Bridge Assembly (DBA) for a HERO filter. The DBA is a wheatstone bridge designed to prevent the RF of concern from igniting the motor. It consists of two stainless steel wires and two copper core, stainless clad wires of proper resistance crimped together. The alternating current induced by the RF is shunted around the igniter squib. The MOD 2 motor uses a stabilizing rod that is hollow core that acts as a conduit for the igniter wires. The DBA increases the resistance of the motor from 0.7 - 2.0 ohms to 2.3 - 3.0 ohms. This additional resistance can cause the fielded aircraft fire control to err during inventory of available rockets. The MOD 4 motor is a new design that will become common to all Armed Services and eliminates the undesirable traits of the previous designs. The first deliveries of the MOD 4 motor will be in 1998. The purpose of the MK 66 MOD 4 Rocket Motor is to improve several safety (specifically E3) deficiencies of the MK 66 MOD 2 Rocket Motor. The MOD 4 motor incorporates a new initiator (MK 26 MOD 0), igniter (MK 311 MOD 0), and E3 filtering. As a result, the MK 66 MOD 4 Rocket Motor is HERO, 300 KV and 25 KV ESD, and EMP safe. The E3 filtering includes a capacitor under the nozzle and two low pass filters located on the igniter and in the initiator. Also, a natural spark gap also exists between the contact band and nozzle body. The bare MK 66 MOD 4 Rocket Motor does not function when exposed to 300,000 volts of Electrostatic Discharge (ESD). During testing, as a worst case test, the U.S. Government forced the charge from the 300 KV ESD to hit the rocket motor contact band (firing contact). The filters reliably diverted the ESD pulse away from the initiator. The MK 26 MOD 0 Initiator, the MK 311 MOD 0 Igniter, and the MK 66 MOD 4 Rocket Motor pass 25 KV ESD (human generated electrostatic discharge). The MK 66 MOD 4 Rocket passed HERO testing using the Apache and Blackhawk helicopters as the test platforms. These helicopters are considered to present the worst case for HERO testing. HERO safe certification exists in letter DD/NSWC 8020 F52-RDD dated 13 April, 1995. EMP analyses on the MK 66 MOD 4 Rocket Motor shows it has an EMP factor of safety of over 35 million. This is because the EMP pulse is extremely short (3 microseconds). The short pulse does not provide enough energy to heat the MK 26 MOD 0 Initiator bridgewire. HYDRA-70 Warheads can be categorized into two areas. Unitary warheads are fitted with impact detonating warheads. Cargo warheads, with airburst range setable or fixed stand-off fuzes, utilize the "wall-in-space" concept. The "wall-in-space" concept provides an extremely large increase in effectiveness and virtually eliminates range-to-target errors due to variations in launcher/helicopter pitch angles during launch. The M439 Fuze is remotely set from the aircraft with time (range) to the target data. After firing, the initial forward motion of the rocket begins fuze functioning at the computer-determined time (at a point slightly before and above the target area), the M439 Fuze initiates the expulsion charge. The submunitions (SMs) are ejected, and each Ram Air Decelerator (RAD) inflates. This separates the SMs, starts the arming sequence, and causes each SM to enter into a near vertical descent into the target area. Similarly, the payload of the M267 is discharged to deploy the three M75 Practice SMs. The M151 HE Warhead is the 10-pound anti-personnel warhead -- traditionally referred to as the "10 Pounder" -- which was designed and developed by the Army and is currently in production. It consists of two main parts, the nose and the base, which are welded (brazed) together. The bulk of the lethality is obtained from the nose section which is fabricated using nodular, pearlitic malleable cast iron. The nose end of the warhead is threaded to receive the M423 Fuze. The M151 can be used M423, M429, and M433 fuzes. The base section is fabricated using steel or cast iron and is threaded for attachment to the rocket motor. The total weight of the loaded, unfuzed, warhead is 8.7 pounds (3.85 kg), of which 2.3 pounds (1.04 kg) is composition B-4 High Explosive (HE). Upon detonation, the warhead fragments into thousands of small, high velocity fragments. The bursting radius is 10 meters; however, high velocity fragments can produce a lethality radius in excess of 50 meters. Temperature limits for storage and firing the M151 are -65 F to +150 F.
The M156 White Phosphorous (Smoke) is primarily used for target marking and incendiary purposes. It ballistically matches the M151 and is of similar construction. Filler for the M156 is 2.2 pounds of WP with a .12-pound bursting charge of composition B. The approximate weight of the fuzed warhead is 9.7 pounds. The M156 uses M423 and M429 fuzes. The M229 HE Warhead is an elongated version of the M151 Warhead and is commonly referred to as the "17 Pounder" warhead. The M229 HE warhead is currently in the inventory. It was designed and developed to increase the lethality and destructiveness of the 10 pound high explosive warhead. The total weight of the loaded, unfuzed warhead is 16.1 pounds (7.3 kg) [other sources report an unfuzed weight of 16.4 pounds] of which 4.8 pounds (2.18 kg) is composite B-4 HE. Upon detonation, the warhead fragments into thousands of small, high velocity, fragments. Temperature limits for storage and firing the M229 are -65 F to +150 F.
The M247 High-Explosive M247 is no longer in production; however, some of these warheads may still be found in war reserve stockage. With a shape charge for an antiarmor capability, the M247 employs a cone shaped charge like that of the M72 LAW. The point initiated detonating fuze (M438) is an integral part of the warhead. The weight of the M247 is 8.8 pounds, of which 2.0 pounds is composition B. 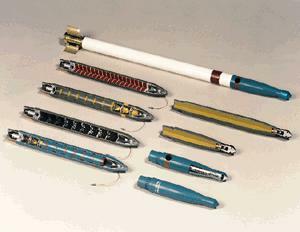 The M255A1 Flechette Warhead design results from a program to develop an air-to-air/air-to-ground warhead with a payload of 1,179 60-grain flechettes. This warhead was type classified standard (for SOF only) and fielded in 1993. The warhead uses many standard components with the M261/M267 Warhead, such as the plastic nose cone, aluminum case, umbilical cable, and the M439 RS Fuze. The M255A1 is intended to be used against light material and personnel targets. At expulsion the flechettes separate and form a disk like mass which breaks up with each flechette assuming an independant trajectory, forming a repeatable dispersion pattern. The flechette uses kinetic energy derived from the velocity of the rocket to produce the desired impact and penetration effect on the target. The M255E1 Flechette flechette warhead, which contains approximately 1,180 60-grain hardened steel flechettes, is in limited production. It is designed for use with the M439 fuze and has possible air-to-air as well as air-to-ground application. The M257 Illumination Warhead with M442 Fuze (delay) was designed for battlefield target illumination. The flare warhead is assembled to the MK66 Rocket Motor in the field. The flare and rocket can be launched from either fixed-wing or rotary-wing aircraft. The M257 consists of an ignition system, flare, main parachute, drogue parachute assembly, and an integral fuze and delay assembly. The warhead is enclosed in an aluminum case. The setback-actuated fixed time integral fuze provides a standoff distance of approximately 3,000 meters. The arming fuze and delay assembly is actuated by motor acceleration. 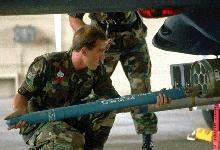 The rocket is fired from the helicopter to attain elevation between 2000 and 4000 feet at 3000 meters downrange. An M442 integral fuze provides a standoff range of approximately 3,000 meters with the MK 40 motor and approximately 3,500 meters with the MK 66 motor. The M257 candle descends at 15 feet per second, burns for approximately 100 seconds with a minimum light output of one million candle power. It can illuminate an area in excess of 1 square kilometer at optimum height. The weight of the M257 is 10.8 pounds, of which 5.4 pounds is magnesium sodium nitrate. The M261 High-Explosive Multipurpose Submunition [MPSM] warhead provides improved lethality against light armor, wheeled vehicles, materiel, and personnel. The M261 is a cargo warhead consisting of a nose cone assembly, a warhead case, an integral fuze, nine M73 submunitions, and an expulsion charge assembly. The nose cone assembly, a plastic cone bonded to a metal cup-shaped base, is attached to the body by shear pins. The body is a hollow cylinder loaded with 9 full caliber multipurpose submunitions (MPSM). Each submunition has a Ram Air Decelerator (RAD), folded, which nests into the shaped charge cone of the submunition ahead; the 9th (forward) submunition nests into the forward cup which makes up the base of the nose cone. A metal pusher plate is located just aft of the submunition cargo stack and is forward of the expulsion charge assembly. The threaded end of the body is machined internally to accommodate a base detonating, remote settable, variable range fuze. The 9 High Explosive (HE) submunitions are deployed by initiation of a 5.5 gram expulsion charge, consisting of 80% M10 double base probellant and 20% Class 6 black powder. The expulsion charge is initiated by an M84 electric detonator contained in the M439 fuze. A pusher plate then ejects the stack of submunitions through the nose cone. The primary warhead fuze, M439, is remotely set with the ARCS, MFD, or RMS to provide range settings (time of flight) from 500 meters to approximately 7,000 meters. On the AH-1, the RMS is programmable only from 700 meters to 6,900 meters. The expulsion charge is initiated at a point before and above the target, approximately 150 meters, depending on the launch angle. The submunitions are separated by ejection, and arming occurs when the ram air declarator deploys. The RAD virtually stops forward velocity and stabilizes the descent of the submunition. An M230 omnidirectional fuze with an M55 detonator is used on each submunition and is designed to function regardless of the impact angle. Each submunition has a steel body that has a 3.2-ounce shaped charge of composition B for armor penetration. The submunition is internally scored to optimize fragments against personnel and materiel. Upon detonation, the shaped charge penetrates in line with its axis and the submunition body explodes into high velocity fragments (approximately 195 at 10 grains each up to 5,000 feet per second) to defeat soft targets. The fuzed weight of the M261 is 13.6 pounds. At shorter ranges, the RAD takes longer to overcome momentum, increasing dispersion. As range increases, the rocket loses momentum, increasing the effectiveness of the RAD. This increased effectiveness reduces submunition drift and ground dispersion. Forestation, other vegetation, and natural or man-made structures within the target area may cause the submunition to detonate or land in a non-standard dispersion pattern. Aerodynamic forces affecting submunitions during vertical descent may prevent them from landing upright (0 degrees off center). Sixty-six percent of the time a submunition will land 5 degrees off center; 33 percent of the time a submunition will land 30 degrees off center. Each M73 HE submunition has a shaped charge that can penetrate in excess of 4 inches of armor. A submunition that lands 5 degrees off center has a 90-percent probability of producing casualties against prone, exposed personnel, within a 20-meter radius. A submunition landing 30 degrees off center has a 90-percent probability of producing casualties within a 5 meter radius. The M264 RP Smoke is used as a red phosphorus (RP) filled smoke rocket propelled by the MK66 motor and functions at a remote settable range from 1000 to 6000 meters. Upon functioning, the M439 Fuze ignites the expulsion mix, which simultaneously ignites and ejects the 5 pound RP payload through the shear-pinned nose cone. The burning RP drops to the ground producing a voluminous cloud of white smoke. Fourteen M264 rockets will screen a 300-400 meter front with a 5-10 knot wind from the unaided eye for a minimum of 5 minutes. The RP pellet stack assembly consists of 72 RP pellets arranged in 18 rows of 4 each and are separated by felt pieces impregnated with a phosphine gas absorbent mixture, manganese dioxide/cuprous oxide. The M267 Practice round is a physical and ballistic match and is identical in operation to the M261 MPSM HE Warhead except that three M75 Practice SMs, with a flash powder smoke signature and six inert SM load simulators, take the place of the nine M73 SMs in the M261 Warhead. The M67 uses the M439 RS Fuze. Each practice submunition contains approximately 1 ounce of pyrotechnic powder. An M231 fuze with an M55 detonator is used with practice submunitions. The M274 Smoke Signature Practice Warhead is an identical flight match for the M151 to provide training with a smoke signature upon impact during practice firing. It consists of a modified warhead casing (WTU-1/B) with vent holes, an M423 Fuze Safe and Arming (S&A) device, and a smoke cartridge to provide the signature flash. A cylindrical cartridge assembly is in the forward section of the casing; it contains approximately 2 ounces of potassium perchlorate and aluminum powder that provides a "flash, bang, and smoke" signature. The M274 weighs 9.3 pounds. The M278 IR Flare Warhead with M439 RS Fuze warhead was designed for battlefield target illumination in conjunction with Infrared (IR) goggles. 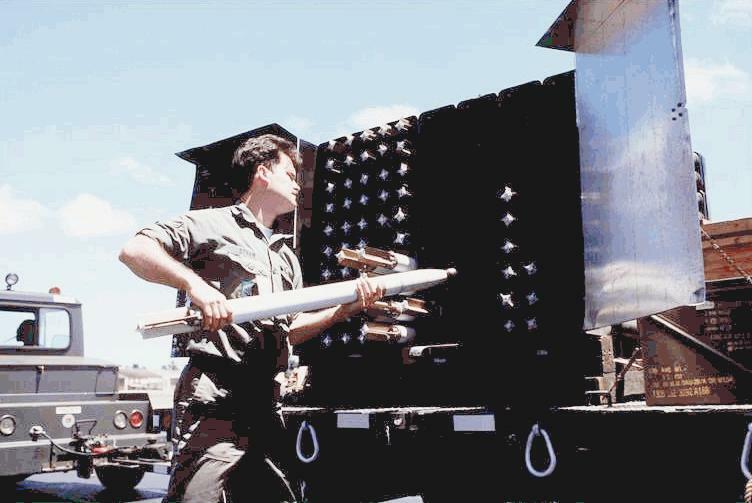 The flare warhead is assembled to the MK66 Rocket Motor in the field. The flare and rocket can be launched from either fixed-wing or rotary-wing aircraft. The M278 provides an average near IR light output of 250 watts/steradian and less than 2K candle power of visible light with a desired goal of 1K candle power. The IR flare will provide IR light for 3 minutes. Time to candle ignition from launch is 13.5 seconds. The M439 Fuze consists of an electronic module and a safe and arming device. The safe and arming device contains the M84 electric detonator in a shorted condition, disconnected from the electric firing circuit, and mechanically out of line with the expulsion charge. The rotor containing the detonator is locked in the out of line condition by a spring-loaded setback weight. Acceleration of 12 g is required to unlatch the rotor. Rotor motion is controlled by a run-away escapement which requires sustained acceleration greater than 24 g for more than 0.6 seconds in order to bring the detonator into the armed condition, i.e., unshorted, mechanically in line, and connected to the electric firing circuit. In the armed condition, the detonator may be fired by an electric impulse from the electronic module. However, in order to produce a firing pulse, the fuze must have had its power supply and firing capacitor charged from an external power source through the co-axial fuze charge line which extends from the ogive of the warhead. The M84 detonator contains an ignition charge of 5 mg of lead styphnate, an ignition charge of 65 mg of lead azide, and a base charge of 65 mg of PETN. It is a low impedance (2 to 5 ohm) bridge wire device requiring 500 ergs of energy to fire. Improving System Accuracy: Development of the MK66 Wrap-Around Folding Fin Aircraft Rocket Motor and integration of new Light Weight Launchers (LWLs) with inproved fire control systems. Increasing System Versatility and Effectiveness: Development of the MK66 Motor; the M261 MPSM; the M439 Remote Range Set Fuze; the M151 HERS Fuzed Warhead; the M255A1 and Air-to-Air Flechette (ATAF) Warhead; the M264 Smoke Screening Warhead; M257 Illumination Warhead; and M278 Infrared (IR) Flare Warhead. Reducing Number of Major Components: No repair parts needed for the new M260 and M261 LWLs. Enhancing Employment Simplicity: Compatability of RS fuzes with new laser range devices and rocket system. Increasing Tri-Service Standardization: Standard compatability of HYDRA-70 components with equipment from all services. 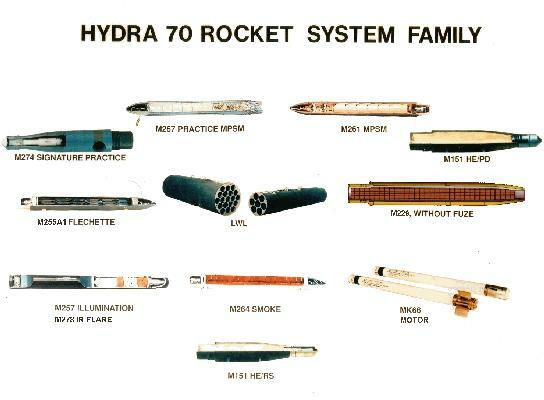 The HYDRA-70 family of rockets can now fill a variety of roles. A multipurpose Submunition (MPSM) Warhead, when added to the new motor, provides reduced range dispersion and improved system lethality. The HYDRA-70 High Explosive Remote Set (HERS) Rocket provides an aircraft with a Remote Set (RS), multi-option capability for use against canopy or bunker penetration targets, as well as against targets in the open. An RS flechette warhead was recently fielded for the SOF. Screening smoke and both visible and infrared (IR) illumination are available for supportive missions. The Navy's Advanced Rocket System planned in the late 1980s to "neckdown" the 2.75-Inch and 5-Inch Rocket Systems to one that mets the requirements of the Anti-Surface Warfare Master Plan. These rockets provide a high volume of air-to-ground fire from stand-off ranges against a broad target spectrum. The program was intended to maximize available RDT&E funds through the use of currently ongoing or planned Product Improvement Programs, NDI and FWE/NCT candidate components. The motor were intended to have a minimum effective range of 10,000 meters direct fire and 15,000 meters loft delivery is required. Warhead were to include Color marking; anti-personnel, material, armor, helicopter and coastal shipping; chaff; flare; smoke screening; night marking; and training. The HYDRA XXI will be an improvement of the HYDRA-70 2.75 Inch Rocket System which is currently in production/deployment phase. The objective is to upgrade the 2.75 Inch Rocket system with and infusion of information age digital technology to fulfill its mission on the Force XXI/digitized battlefield of the 21st Century. This will be accomplished in the near term through Materiel Change upgrades of components(warheads, fuzes, rocket motor & launcher) to address emerging and changing requirements such as Insensitive Munitions, Hazards of Electromagnetic Radiation to Ordnance, environmental and other operational deficiencies that may develop as the system progresses in service. Other upgrades will include the evaluation and development of fuzes and warheads to meet new operational needs identified by the Army, Navy, Marine, Air Force, and Special Operation Forces such as employment in Military Operations in Urban Terrain. Additional applications are being pursued for the use of the system for light infantry and ground mobile forces. The improvement of the system is being managed by the Project Manager for the 2.75 inch rocket system located at the Industrial Operations Command at Rock Island IL, who has developed a Joint Service Improvement Plan which is a road map for the improvement of the rocket system. FM 101-50-27-2 JMEM, Air-to-Surface, "Helicopter Deliveries (Materiel)", Revision 2, 12 Oct 1990. Classification: SECRET. Distribution authorized to U.S. Government agencies only. Other requests for this document must be referred to Director, AMSAA, Attn: AMXSY-J, Aberdeen Proving Ground, MD 21005-5071. This document contains tables of probability of kill (M, M/F, F, M/P) as a function of volley size, altitude, slant range, and airspeed against armored vehicles (T-62, BMP-1, BTR-60pB, T-80+, ZSU-23-4) for AH-64, AH-1F and "Simple" fire control firing the M151 and M261 warhead. FM 101-50-27-1 JMEM, Air-to-Surface, "Helicopter Deliveries (Personnel)", 2 Oct 1975. Classification: CONFIDENTIAL. Distribution authorized to U.S. Government agencies only. Other requests for this document must be referred to Director, AMSAA, Attn: AMXSY-J, Aberdeen Proving Ground, MD 21005-5071. This document contains tables of fractional coverage of personnel (standing, prone, and fox-hole) area targets (10x10m, 50x50m, 100x100m, 300x300m targets) for the M151 as a function of total system error, altitude, ground range, and airspeed. FM 101-50-20 JMEM, Air-to-Surface, "Weapon Characteristics (JMEM)", 1 Apr 1995. Classification: SECRET. Distribution authorized to U.S. Government agencies only. Other requests for this document must be referred to Director, AMSAA, Attn: AMXSY-J, Aberdeen Proving Ground, MD 21005-5071. This document contains static fragmentation data for the M151 and M261 warheads. It also contains penetration data of the M73 submunition (profile hole diameter as function of standoff and penetration). FM 101-50-1 JMEM, Air-to-Surface, "Weapon Effectiveness, Selection, and Requirements (Basic JMEM A/S)", 31 Jan 1995. Classification: CONFIDENTIAL. This document contains lethal areas as a function of angle-of-fall for personnel, armored (light and heavy), artillery, parked aircraft, land transportation (trucks and locomotives), radar installations, communication antennas and jammers, missile sites, and industrial targets for the M151 warhead.